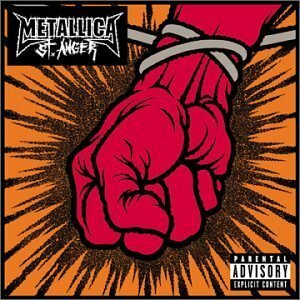 Hall of the Mountain King: Review: Metallica, "St. Anger"
It's a day that I thought I'd never see - the day Metallica released another album I liked. Like many other Metallica fans that discovered the band in their thrashing early days, I had given up hope after more than a decade of overproduced, radio-friendly rock tunes. But with "St. Anger," their first album of original material since 1997, Metallica returns to the top of their game. Is it a return to their thrash roots? Not exactly. If you take tapes of everything Metallica has ever recorded since their 1983 debut "Kill `Em All," chop them up and splice the pieces back together at random, what you'd end up with might sound something like "St. Anger." There are elements that would have been right at home on their classic "Master of Puppets" album, and others that sound like they came off the band's mid-1990s albums "Load" and "Re-Load" - quite often within the same song. The result is utter chaos - but it's a good kind of chaos. It put me in mind of the first time I heard "Kill `Em All." The execution of the songs was a little rough, but the energy coming off the album was incredible. It's been a long time since Metallica has captured that feeling. From the machine-gun riffing of the opening track "Frantic," to the Southern-rock-on-steroids shuffle of "Sweet Amber," there's something on this album that every Metallica fan, old or new, can appreciate. In the days after its release, fan opinion on Web forums dedicated to the band has been sharply split. Some of the criticisms are legitimate. The production is pretty rough, and I would have liked to hear Kirk Hammett lay down a couple of monster guitar solos. But the raw energy on this album more than makes up for those problems. There are a couple of snoozers, like the vanilla "Unnamed Feeling" and "Invisible Kid," which wears out its welcome long before its 8 plus-minute runtime is over. On the other hand, songs like the album closer "All Within My Hands," the thrashing title track and the groove of "Shoot Me Again" easily justify their 7-plus minutes with wild tempo shifts, insane bursts of speed and soft, melodic interludes. Metallica is also one of the first bands to hit on the real way to combat song-trading online - by adding value. For the price of the "St. Anger" CD, you also get a DVD of the band rehearsing all 11 songs live (with new bassist Rob Trujillo's talents added on the DVD, some of the rehearsal versions sound better than the songs on the album) and a code that gives you access to the Metallica Vault Web site, where you can download live performances. The site will be updated regularly with new stuff. The result is a package that makes me feel like I got my money's worth. Of course, no matter what special features the package has, the real treat is the return of Metallica. It's not the same Metallica I remember from my youth, but a new Metallica with the potential to be even better. In the end, "St. Anger" is a big middle finger to people like myself who have accused Metallica of going soft over the past decade - and I, for one, love it.